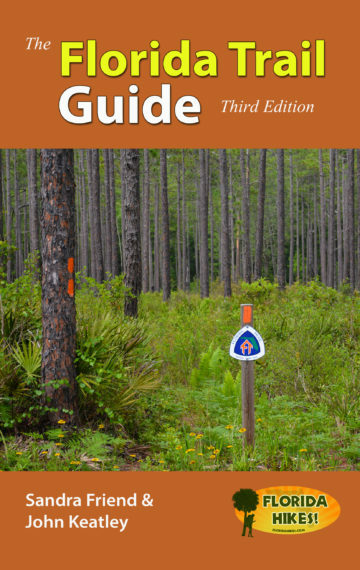 Now in its third edition since 2013, our award-winning guidebook to the Florida National Scenic Trail provides comprehensive end-to-end coverage of more than 1,400 miles of hiking in Florida, a must-have for planning a long hike on the Florida Trail. It’s not just for thru-hikers, however. Mileage charts, overview maps, and descriptions of significant waypoints along the trail let you sit and plan a day hike or a short backpacking trip as well. On the order page, you’ll have the opportunity to look at sample pages from the book to see how the charts, maps, and descriptions work together. Accurate mileages based on GPS. More detailed mileage charts with more waypoints. At least 10 new designated campsites statewide. More than 40 miles of relocations updated. More than 20 miles of roadwalks eliminated. Hundreds of additional trail landmarks described. More in-depth detail for hiking in Northwest Florida. Data spreads clustered at the beginning of each chapter for easier grab-and-go. Logistics for nearly 1,500 miles of hiking. 43 updated regional overview maps. 62 town maps annotated with updated service details. 18 sections, including connector trails. Section and thru-trail mileage for each chapter. Mileage details based on trail landmarks. Post office hours and locations. Lodgings and campgrounds near the trail. Outfitters and shuttle providers along the trail. Contact information for thousands of services. How to get to and from the termini. Basics for hiking in Florida. A list of camping and backpacking outfitters in Florida. A list of where to buy stove fuel along the trail. A full list of where to send maildrops. Alternate routes provided for flooding and closures. Southbounder alerts throughout the book. All roadwalks are highlighted in the text. Eastern Continental Trail details for Key West to Big Cypress. Florida Keys Overseas Heritage Trail details, good for hikers and cyclists. Links to more details online. A geolocated version of the information in this guidebook is available as an app for iPhone or Android through Atlas Guides. Using the GPS technology in your smartphone, the app works offline, showing you where you are on the trail and the resources near you. RETAILERS: This book is available within the United States at a wholesale discount. Become a reseller.